The Israeli Air Force Struck several targets in the Gaza Strip before dawn on Monday, after terrorists in the Gaza Strip fired a rocket into Israel, which was intercepted by the Iron Dome system. “Air force fighter jets and helicopters attacked several terror targets at a Hamas training camp in the northern Gaza Strip,” the Israel Defense Forces said, noting the attack was in response to the rocket fired into Israel. “The IDF holds Hamas responsible for all that takes place in the Gaza Strip,” the army said. Palestinian media reported that Israeli helicopters attacked at least one Hamas training site near Beit Lahia in northern Gaza. Earlier, warning sirens blared in the southern city of Ashkelon and the nearby Hof Ashkelon region after 3 a.m. The IDF said it identified a single launch from Gaza, which was intercepted by Iron Dome. On Sunday morning, a bomb was flown into Israel using a large cluster of balloons and a model drone. The explosive device landed in a carrot field in the Sdot Negev region of southern Israel shortly before noon. In retaliation for the cross-border attack from Gaza, Israeli military helicopters attacked two observation posts east of Khan Younis that are controlled by the coastal enclave’s Hamas rulers, the Israel Defense Forces said. “IDF attack helicopters struck two military positions belonging to the Hamas terrorist group in the Gaza Strip in response to the balloon-borne explosive device, which was launched by a model drone,” the army said. 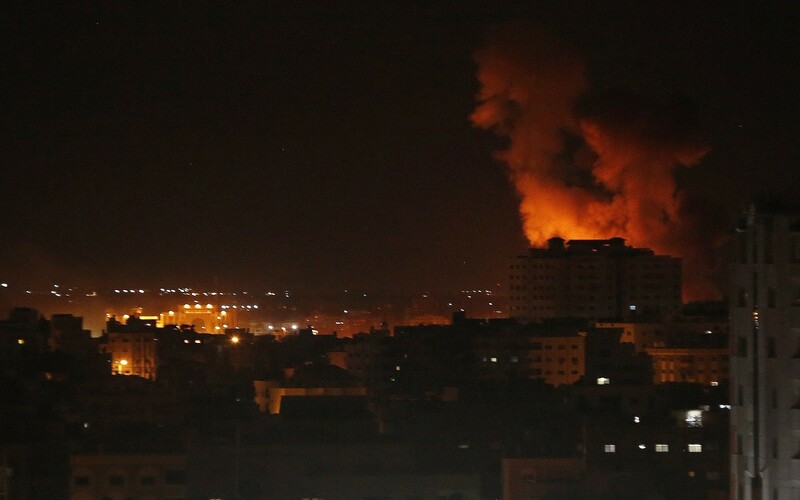 In addition to the posts near Khan Younis, Palestinian media reported that the IDF had attacked targets near Jabalia, in northern Gaza, and in the Zeitoun area of Gaza City, in the central Strip. The IDF refused to comment on those reports. The military did not say who it believed flew the bomb into southern Israel, but said it held Hamas responsible as the rulers of Gaza. “The IDF will continue to act in defense of the citizens of Israel and against terrorism from the Strip,” the army said. The name of a Gazan engineering college was printed on the side of the model drone. Police said the explosive device attached to the model drone and the balloons exploded as a bomb disposal robot examined it. The drone lookalike was then carried away. “No injuries were caused; the investigation continues,” police said. It was not immediately clear how the device made it across the border without being shot down by the IDF. The police reiterated calls to Israelis to contact law enforcement if they see suspicious objects. The discovery came after a week-long lull in airborne arson attempts from Gaza. Gaza protesters have launched hundreds of incendiary kites and balloons into Israel over the past nine months, sparking fires that have destroyed forests, burned crops, and killed livestock. Thousands of acres of land have been burned, causing millions of shekels in damages, according to Israeli officials. Some balloons have also carried improvised explosive devices. This entry was posted on January 7, 2019 at 12:37 PM and is filed under Uncategorized. You can subscribe via RSS 2.0 feed to this post's comments. You can skip to the end and leave a response. Pinging is currently not allowed.